The Atlantic Salmon Federation says Greenland would not budge below a quota of 45 tonnes, which was more than other Parties to the West Greenland Commission (made up of Greenland, Canada, the United States and the European Union), could accept. This will have a devastating effect on already endangered, threatened and at-risk salmon populations in North America and southern Europe. The Atlantic Salmon Federation (ASF) is very disappointed over the failure of the North Atlantic Salmon Conservation Organization (NASCO) to limit Greenland’s salmon harvest to sustainable levels, during negotiations to set regulatory measures at meetings that took place June 2 to 5 in Goose Bay, Labrador. Greenland would not budge below a quota of 45 tonnes, which was more than other Parties to the West Greenland Commission (made up of Greenland, Canada, the United States and the European Union), could accept. Denmark on behalf of Greenland unilaterally committed to limit the total annual catch for all components of its fisheries to take no more than 45 tonnes in 2015, 2016 and 2017. The situation is dire throughout most of eastern Canada and especially so in the state of Maine, where the last of the U.S. Atlantic salmon are clinging to survival. According to the 2015 report of the International Council for the Exploration of the Sea (ICES), Quebec rivers met only 44% of their minimum conservation limits for the large salmon that spend two winters at sea (2SW), a serious decline from 76% in 2013. The salmon populations of Southern Gulf of St. Lawrence rivers attained only 54.5% of their conservation limits, another serious decline from 80% the year before. The Southwest Miramichi reached only 69% and the Northwest Miramichi a dismal 21% of their conservation limits. 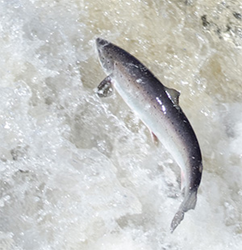 Salmon populations along the outer Nova Scotia coast and in Bay of Fundy rivers reached an abysmal 2.7 % of their conservation limits, far lower than the 12% of 2013. The Conne River salmon that represent the threatened south coast populations of Newfoundland met only 49% of their conservation limit. In southern Labrador, the Sand Hill, Muddy Bay Brook and Southwest Brook achieved only 56%, 66% and 72% respectively of their conservation limits. In the United States, 2SW salmon populations attained an appalling 2% of their conservation limits. “Greenland’s intent to harvest 45 tonnes each year from 2015 to 2017 will put our salmon at further risk, detracting from the many expensive programs carried out to restore wild Atlantic salmon runs in North America,” said Mr. Taylor. “The Greenland fishery jeopardizes such programs as the $64-million Penobscot River restoration in Maine to open up salmon habitat and the million dollar liming program to combat the effects of acid rain on the West River Sheet Harbour in Nova Scotia. There are hundreds of other projects on rivers throughout eastern Canada and northeastern United States that will be affected. It is devastating that the hopes and dreams for the salmon of these rivers will continue to be at risk of being scooped up in gillnets off Greenland,” said Mr. Taylor. Greenland is getting a lot of pressure from its fishermen for a much larger salmon fishery and to be allowed to sell their salmon to markets outside Greenland. At the meeting, Greenland read a statement by The Association of Fishers and Hunters in Greenland (KNAPK), who are demanding salmon that they can process and sell and contribute to the growth of their country’s economy through export. KNAPK’s written statement indicated that the fishermen wanted a minimum of a 1,500 tonne quota. While the other Parties used every avenue at their disposal to lower Greenland’s harvest to a level more in line with the advice of ICES, this was impossible under the NASCO Convention that requires unanimous support by all Parties to the regulatory agreement. It is laudable that the Faroe Islands once again agreed to no catch on their feeding grounds, where 20% of the catch could be made up of North American salmon that migrate there. NASCO did agree to improved monitoring and control measures to be implemented by Greenland. One option now is for a private agreement to be worked out, like the one that was in effect between 2002 and 2011, before Greenland’s harvest began to escalate in 2012. The escalation was due to the introduction of a fishery to sell salmon to factories and Greenland’s insistence that the subsistence fishery has no cap. The private agreement was between the North Atlantic Salmon Fund (NASF) of Iceland, the Atlantic Salmon Federation, KNAPK, and the Greenland Government. NASF has had a private agreement with the Faroes fishermen since 1992, which has helped keep catches there at zero. NASCO is an intergovernmental organization formed by a treaty in 1984 and is based in Edinburgh, Scotland. Its objectives are the conservation, restoration and rational management of wild Atlantic salmon stocks, which do not recognise national boundaries. It is the only intergovernmental organisation with this mandate which it implements through international consultation, negotiation and co-operation. The Parties to the Convention are: Canada, Denmark (in respect of the Faroe Islands and Greenland), the European Union, Norway, Russia and USA. There are 35 non-government observers (NGOs) accredited to the Organization. Atlantic Salmon Federation representatives on the Canadian delegation to the NASCO meeting in Goose Bay, Labrador were David Meerburg (Scientific and Policy Advisor), Sue Scott (VP Communications) and Don Ivany (Director, Newfoundland and Labrador Programs). Sue Scott serves as Co-chair of the 35 non-governmental organizations accredited by NASCO.